I had the opportunity to be a part of a practice/training session with friends and colleagues led by master photographer Ramiro Cervantes. Here are a few of my favorites, as well as a few concepts and tips on how the images were created. 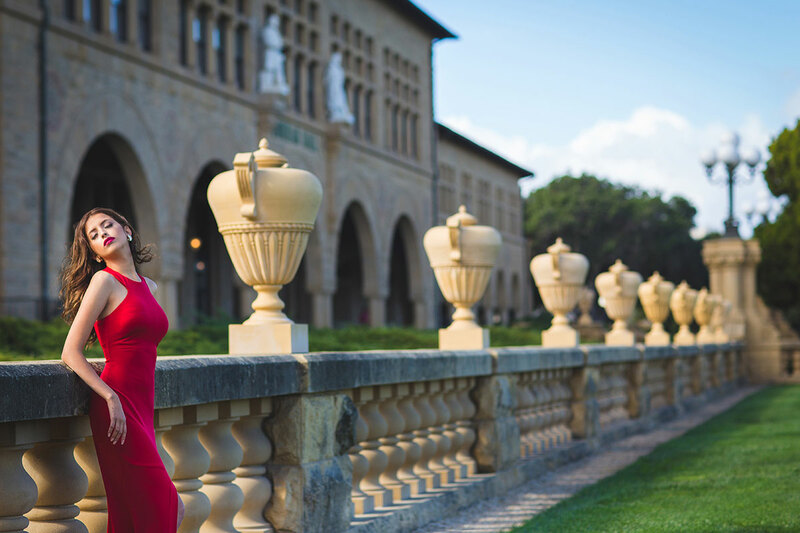 Shoots done in Stanford University (Palo Alto) and San Jose. Concept 1: Directional, diffused light. 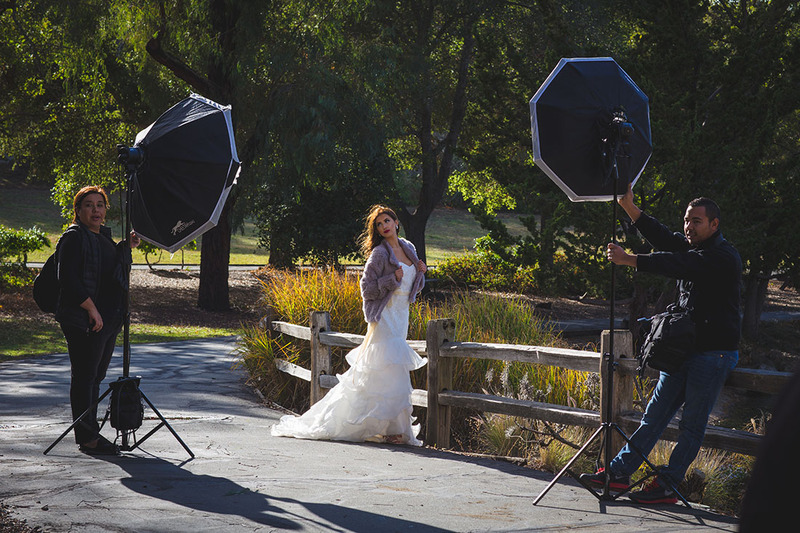 The 2 things that are important for good natural light are direction and quality of light. In the following three examples, we've placed our model directly in the sun's path, rather than in the shade. She is lit from the side, with her face towards the light. This gives us beautiful and flattering short lighting. If she was to stand just 5 ft behind, in the shadow of the building, the light would have been soft but flat and poor, lacking direction. Note that this works because at this moment the sun is covered by a cloud, diffusing/softening our light. Within 15 minutes, the cloud would have gone away and this shot would no longer have been possible. Not only would our model have had difficulty looking directly at the sun, but the light on her would be harsher and the shadows more pronounced. One way to get directional, diffused light is to use light tunnels. Light tunnels are thresholds or borders where light sharply ends. The idea is that you place your subject just a few inches behind the direct light, just enough to where the hotspots on your model disappear. Another way to visualize this is to imagine that you are placing your subject at the edge of a cave. As seen in this behind-the-scenes shot, the noon sun is harsh and hits the columns and floor creating very hard shadows, yet our model’s light is soft. *The small reflector that you see in this shot is not actually reflecting light. Rather, its turned black side out, preventing the reflective light hitting the right column from uplighting our subject. This kind of diffused side light, is similar to the concept of light tunnels. Your light fall-off in this case is less dramatic, as you are placing the model further away from your light source (inverse square law). In a way, this gives us a similar effect to window light. For these shots, we used strobes to light our model. The formula is simple yet incredibly powerful. You meter for your ambient light, taking care not to blow out the sunlit hair light. In this case it gives us an F8. From there your main light should measure 1/3 of a stop down, which would be F7.1. Our fill light is one whole stop below that, so that would be 5.0. Combined, they give us a meter reading of F8, which allows our subject and our background to be perfectly exposed. Very similar to the 2 light setup. In this case, since we have big blue skies, we are metering for the skies. This gives us a target exposure of Fll. Our main light should be 1/3 of a stop down, to F10. Our fill light is a whole step below that, so F7.1. Our backlight should be a full step above our main light, so F14. I want to thank Ramiro Cervantes for leading us in this practice/training session, as well as Christine Diaz for putting together this incredible learning experience. I also want to thank the wonderful model Julia and the rest of the crew that made this all come together.